My family loves bread. I bake it from scratch almost daily - in the summer, this used to mean a really hot kitchen! 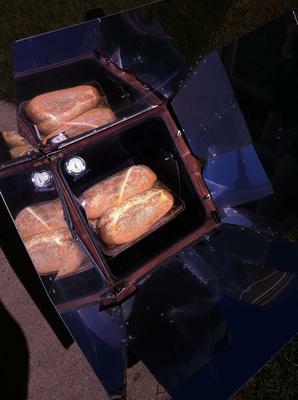 Fortunately, my solar oven does as good a job with bread as the electric oven, without heating up the house. I swap some of the white flour for whole wheat, add a little extra water to compensate for the drier flour & sometimes bake in bread pans. The recipe is quick, easy & forgiving! Cover dough & let rise about an hour - it should just about double in bulk. The more wheat flour you add, the longer the rise may take - that's OK! Cover & let rise again for another hour, until very puffy. 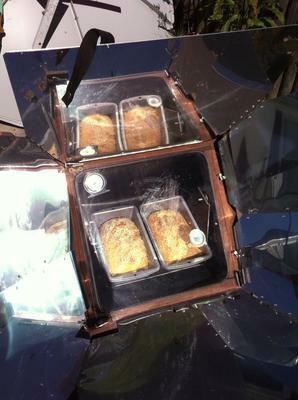 Focus your solar oven during the second rise, aiming for 400F. (On a clear New England fall day, this is no problem!) If your temperatures are running lower, you'll just need to add a little extra time baking. Not to worry, this loaf will bake even at 250-275F! 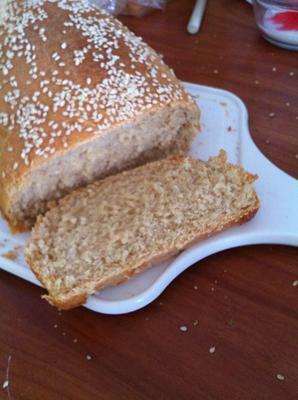 Brush the top of the loaves with milk, then sprinkle liberally with sesame seeds. If you're really feeling Italian, slash the loaves diagonally for an "authentic" look. Transfer the pans immediately to the oven to bake. Bake for about 25 minutes, or until the top is golden brown & the internal temperature of the bread reaches about 200F using an instant read thermometer. If your oven temperatures are running lower, don't fret. It'll finish eventually! If you don't have an instant read thermometer, the bread should sound hollow if you tap on it lightly. (But consider picking up an instant read gadget...you'll use it a lot with solar cooking!) On poor-sun days, I've had to bake this well over an hour...it still tastes delicious! Feel free to tinker with this recipe - change the ratio of white/wheat flour, use white/red wheat, top with different seeds (sunflower is yummy! ), use milk instead of water...this recipe adapts well to what you have on hand. Keep in mind that the higher the percentage of whole wheat flour, the less rise you'll get & the more liquid you'll need to make a smooth dough. If you have technical baking questions, stop by the KAF website above - they run an online baker chat service to answer your questions about ingredients & bread techniques. Thank you for the recipes and the great instruction. This should be very helpful to others. Wow, i don't bake, but I wish I did. Your bread recipe sounds delicious!